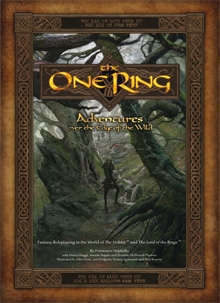 This is the PDF version of the 2011 slipcase set of The One Ring. The new, revised, single volume 2014 edition can be found here. "THE WILD WAS STILL THE WILD, AND THERE WERE MANY OTHER THINGS IN IT IN THOSE DAYS BESIDES GOBLINS"
But much danger still remains, and from the Orc-holds of the mountains to the dark and corrupt depths of Mirkwood a darkness waits, recovering its strength, laying its plans, and slowly extending its shadow . . .
Adventures over the Edge of the Wild is the core set for The One Ring roleplaying game. Set five years after the events narrated in The Hobbit, it introduces players to the world of Middle-earth focusing on Wilderland, the region visited by Bilbo in his journey to the Lonely Mountain. Future core and supplemental publications will advance the timeline and explore other areas of Middle-earth. I have read, run, played, and/or written over fifty different role-playing games; to be fair, it's roughly forty-five unique systems, some games including GURPs, Palladium's system, Living Steel and Aliens Adventure Game, D6, etc. This game book is amazingly beautiful, the artwork evoking images of Tolkien's fantasy world are fantastic, and it's got two beautiful inside covers, the maps of which I wish were readily available online. Alas, the book is absolutely riddled with typo's, and the organization of it is absolutely horrible. I can easily see me NEVER teaching this to a group of role-players. There are so many rules and ideals spread all over the place, that compiling them would leave every player in a group mystified as to whatever they can do. Torg: Role-Playing the Possibility Wars, Warhammer Fantasy Role-Play 1st AND 2nd Edition, and the BattleTech Role-Playing Game are easier to teach and run than this game, by far. For my tastes, there are simply too many nebulous concepts for the...See more game to run smoothly for multiple sessions, at least. This game would be for advanced players. I was reviewing chapters on my forum as I was reading along, but I stopped with combat... it's ridiculous in execution, and there are concepts Francesco Nepitello, in the way he's written it, doesn't seem like he's completely certain about. I'll continue to read, but the next edition of this game needs to be better organized, and the concepts cleared up. For example, recovering Endurance shouldn't have two tables set 32 pages apart. Also, when I was reading initially, I was taken with the understanding that to-hit, you roll the Feat die, your Combat success die/dice, and then add your Body to the score, but once I got to combat, I found out a character's attributes have nothing to do, at all, with your scoring, unless you spend a Hope point, which is something of a reversal of how in-game currency generally works. Likewise, I thought you were supposed to roll a to-hit, and then the character being hit has their Feat die and Armor die added together against that roll, which again was cleared up in combat. So, there's a lot yet to be done with this game, and I would not consider it to be in a good place for release. Again, it's a beautiful book, but it needs help. It took some work, but I was able to get into this game, this book, drawn to it like a moth to a flame, and I have now figured out all I needed to know to run this game, effectively, and I now want to run this game. The things I said about the book being disorganized and full of typo's is correct, but there is no denying the faithfulness of Francesco Nepitello's work to Tolkien's work. Quite simply, this would be an excellent addition to the works of The Tolkien Society. I apologize to Cubicle 7 if I've caused any problems with sales for this game. However, you do need to take it back to the editing crew and have it gone through, yet again, for typo's and organization. Any chance we can get this pdf updated with the new stuff in the revision? I don't want to carry and browse an additional document. A $30 ebook? Seriously? The hardcover is $40.21 on Amazon. Lowest price is £130 ($220) on Amazon.co.uk. Seems like a deal to me. I’ve read there are changes to the original books (they are called Guides now, no longer Books). Is there any new content or has the errata been incorporated? I've compared the old and new PDFs, and there are no changes other than the consistent replacement of "Book" with "Guide". So one that has the new PDFs should ignore this set, correct?